As the Bidwell-Bartleson Party approached Scott’s Bluff, they faced a problem that they hadn’t encountered yet on their journey–a barrier. Pioneer companies followed rivers, but they didn’t cross them any more than they had to, because crossing a river was a difficult and dangerous undertaking. They had been following the Platte River, but now the river ran right under the bluffs. 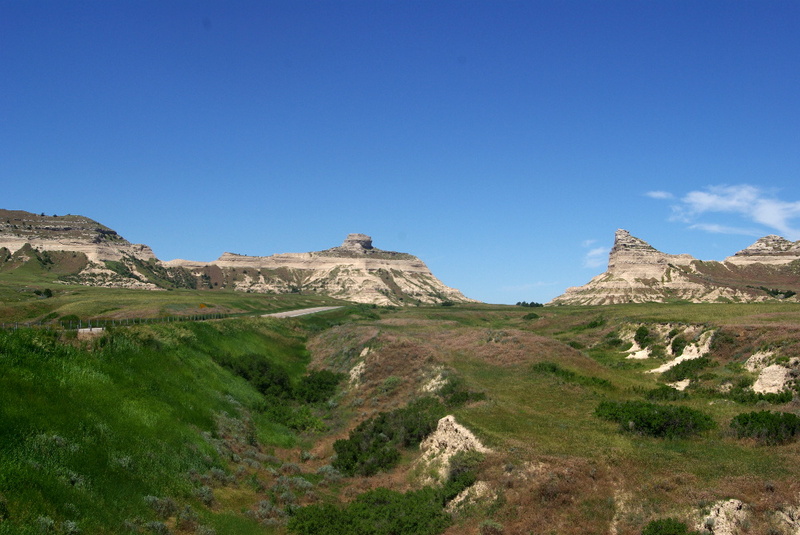 So with Scott’s Bluff before them, they had three choices: cross the river and see if traveling was better on the other side, go around the short range of hills on the south (now known as the Wildcat Hills), or head straight for the gap. The Gap seems to be the obvious choice, but when I spoke to a ranger at Scotts Bluff National Monument, he told me that getting through the Gap was too difficult and wagon trains before 1851 were forced to go the long way around the hills. In 1851 the U. S. Army built the road through Mitchell Gap, making it passable for wagon trains. If you look at the photo above you will see the highway that follows that road today, but you will also see the ravines that made traveling through the Gap so arduous. Sunday, 20th. Passed through the Gap–came into an extensive plain, the beautiful scenery gradually receded from view–came to a creek called Horse–passed it, reached the river again–cool and windy–having come about 23 miles. They took those hills in stride and carried on, making good time. This entry was posted in Oregon Trail. Bookmark the permalink.